The Channel Island fox lives exclusively on six of the eight Channel Islands off the coast of Southern California. The fox population on each island is considered a unique subspecies, distinguished by both genetic and physical differences. Their range includes the three largest islands in Channel Islands National Park — Santa Cruz, Santa Rosa and San Miguel islands. A third smaller than its mainland ancestor, the grey fox, island foxes are one of the smallest canid species in the world. The island fox has rust-colored sides with a gray back, white underbelly, and distinctive black, white and rust-colored markings on its face. The fox prefers the shrubby and wooded areas on the islands — chaparral, coastal scrub and oak woodlands. The island fox’s diet varies because of the differences in each island’s flora and fauna. The fox primarily eats plants and insects, including fruits from cactus, manzanita and sea figs as well as crickets, beetles, earwigs and deer mice, when they are present. On occasion the fox forages along the shoreline for crabs and other marine invertebrates. The Channel Island fox population began to experience declines when late 19th-century settlers introduced livestock to the Channel Islands. As some of their pigs escaped, the feral swine attracted non-native golden eagles to the islands. A simultaneous decline of the islands’ native bald eagle population facilitated the establishment of the new birds as resident breeders on the islands. Hunting piglets, the golden eagles also developed a taste for the small foxes. Having never developed defensive instincts, the thriving fox population was left exceptionally vulnerable to the new predators. On the island of Santa Catalina, foxes were also devastated by canine distemper brought by dogs that accompanied visitors to the islands. The fox population plummeted by 90 percent to fewer than 200 members in the late 1990s. In 2004, the foxes were officially declared endangered under the federal Endangered Species Act. 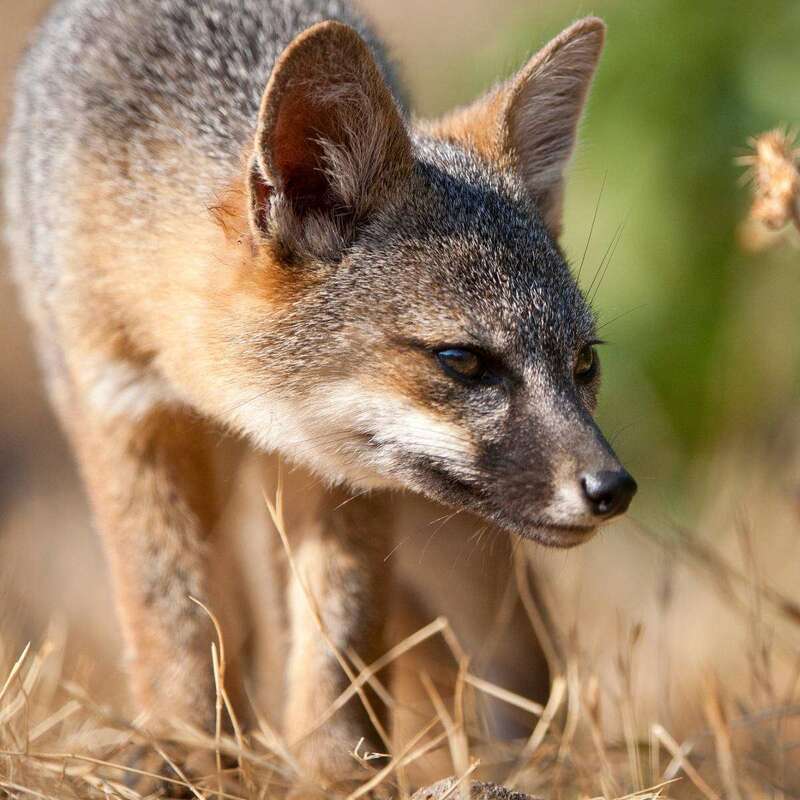 Prior to their listing, Channel Islands National Park established a recovery program in 1999 to save the island foxes from extinction. The park began a captive breeding and reintroduction effort, removed the islands’ predatory golden eagles, and reestablished the native bald eagle population. Simultaneously, a two-year pig eradication program successfully eliminated the islands’ feral pigs. The national park partnered with The Nature Conservancy to restore natural ecosystems that the island fox depends on for survival, dredging wetland areas that had been filled with gravel and removing non-native plant species. Because of efforts by the national park and partner organizations, the Channel Island fox population underwent a rapid recovery. Channel Islands National Park reported that Santa Rosa Island’s population of 15 surviving island foxes in 2000 had grown to over 800 by 2016. The Santa Cruz population was estimated at over 1500 adults, and the population on the smaller island of San Miguel has increased from only 15 foxes to over 500. In 2016, the foxes of San Miguel Island, Santa Rosa Island and Santa Cruz Island were delisted. After successful recovery efforts, the fox population on Santa Catalina Island was downlisted from endangered to threatened in 2016. The population still faces challenges brought by pets of the island’s visitors. To protect the island’s foxes from canine diseases, a percentage of the foxes are actively vaccinated against rabies and canine distemper. As part of ongoing protection efforts, all island fox populations are monitored via radio tracking by the national park and partner organizations to ensure the species’ population continues to grow.